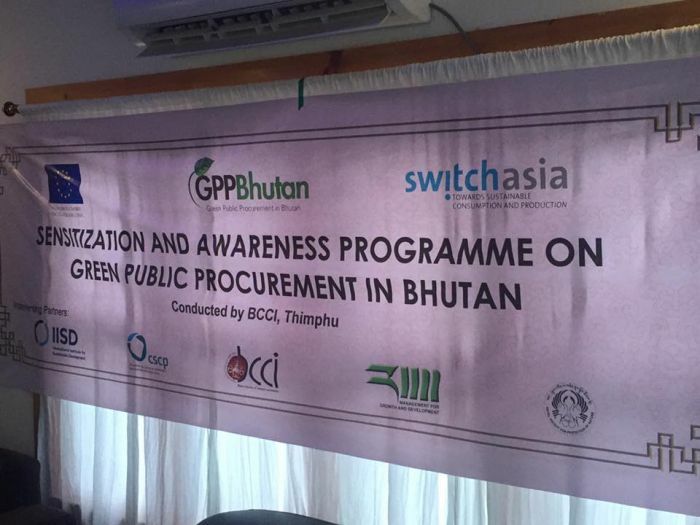 Green Public Procurement (GPP) Bhutan Project team conducted two one-day GPP sensitization and awareness events for 46 participants that included manufacturers, retailers, suppliers and executive members of Bhutan Chamber for Commerce and Industry (BCCI) in Gelephu on August 29 and 31, 2016. The main objective of the program was to create awareness and sensitize suppliers on GPP concept and importance of integrating environmental, social and economic aspects in sustainable business enterprises. The topics covered in the program were introduction to the GPPB project, GPP concept, life cycle thinking and hotspots analysis and group work on the relevant business cases or products. 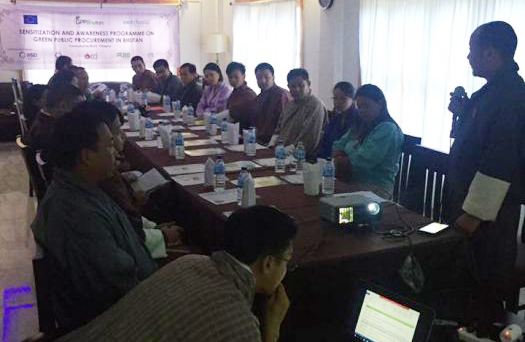 Royal Society for Protection of Nature is part of the GPP Bhutan team and RSPN/GPP project’s major activities include mapping of Public Procurement and institutional arrangement and procedures for public procurement. Since 1987, the Royal Society for Protection of Nature (RSPN) has evolved as a complementary partner to the Royal Government of Bhutan in the preservation of Bhutan’s rich natural heritage. RSPN today, is considered a pioneer environmental organization by governments and international NGOs. Since 1999 till 2012, RSPN has enjoyed the Royal Patronage of His Majesty Jigme Khesar Namgyel Wangchuck, the King of Bhutan. The Queen of Bhutan, Her Majesty the Gyaltsuen Jetsun Pema Wangchuck is the current Royal Patron of the organization. RSPN’s main focus areas are Climate change, Sustainable forest and land management, Species and habitat management, Water resources management, Sustainable development and livelihoods, Environmental education and advocacy, and Research.